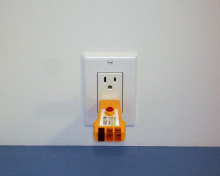 This device allows you to run a 230 Volt Vapor Rino off of two household 115V outlets. This Instant 230V Power Supply allows you to create 220/240V by combining two ordinary household (non GFI) outlets on independent circuits. This allows you to run the 230V Vapor Rino in your home without having to install a special outlet or buy a generator. Instant Power when you need it. Access to 230V volt power is made easy, fast and safe without the heat and weight of an expensive step-up transformer. More information below. Read the FAQ tab for limitations. 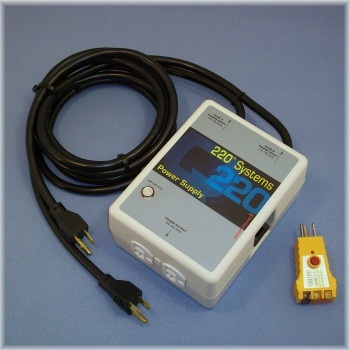 information supplied with this instant 220 power supply before use. Check your 110/120 volt outlet with the tester supplied to make sure the outlet is wired correctly and does not have a ground fault interrupter (GFI) in the circuit. Plug the other power cord into a different outlet. Use an extension cord of appropriate length, as necessary. The two outlets will be farther from each other than shown in the picture. This is just an example picture. You want two outlets that are on different circuits. Step 4 (amber light) will confirm when you get it right. expensive large generator. More information below. want it and without costly permanent installations. you as part of a mobile charging setup for your electric vehicle. used it should also be 12-3 or heavier. outlet is GFI or not. system really has made my life easier in this area. at 240 volts, 16,500 watts peak, typical at 230 volts. One year, see enclosed warranty for full text. I Want it! What do I NEED TO KNOW first? This system works great with a 230V Vapor Rino. That said, if you are going to use this 230V converter to power one of our Vapor Rino Steam Cleaning systems there are few things you should be aware of. 1) When using extension cords use the RIGHT SIZE. Use heavy duty, 12-3 AWG extension cords (or heavier) with 3 prongs. 2) The 230V Rino's run close to maximum wattage. When plugging in your converter be sure ALL OTHER ITEMS in the home, on those same circuits are turned off. You will need all the available power from both 15 amp, 115V outlets to run this machine. Having other appliances turned on will take power away from this system and may cause you to trip a breaker. Turn off or unplug all items in that part of the home, on the same circuit before using this system. 3) You cannot plug this converter into a GFI outlet. Most of the time you can identify these outlets by the 'reset' and 'test' buttons on the outlet itself. You will most often find these GFI's in a kitchen or bathroom. The converter will not work off of a GFI outlet. Just plug it into a standard 15 or 20amp outlet. You can use the INCLUDED tester to see if an outlet is GFI or not. 4) When running full power it is recommended to "rest" the converter from time to time. See specifications for more information. Full power at 80% on, 20% off (time), 3 hr. max. It may be a good idea to turn off your machine for 10 minutes after every 60 to 120 minutes or so to let the converter rest. Also, keep your converter out of direct sun light and never cover or enclose the converter. This will avoid overheating. 5) If your location has low voltage coming into the home it is possible that this system may be under powered for use with a Vapor Rino. Voltages below 110V may have issues. This is not definite, but possible. You can buy a cheap voltage tester to see what your outlets are putting out. Anything over 115 Volts is great. How does the 220 Volt Power Supply work? How does the Quick 220 Power Supply work? The 220 Power Supply technically uses the fact that 220 / 240 volts AC is supplied to most facilities. The 220 / 240 volts is divided into 110/120 volt circuits for distribution within the building. 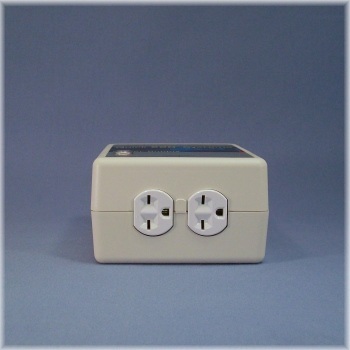 Using standard 110 / 120 volt outlets and the Quick 220, the user can quickly identify and connect to the separated 110 / 120 volt halves of the original 220 / 240, restoring the 220/240 volt AC option without adding new electrical circuits or wiring to the building. How do I use this 220V Power Supply? SEE :HOW TO SETUP TAB FOR DETAILS. 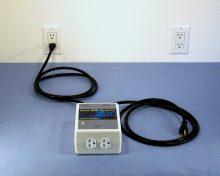 Overview: First, connect one of the 220 Power Supply cords to a standard 110 / 120 volt outlet. 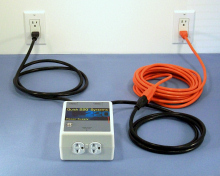 Next, connect the second power cord from the Quick 220 Power Supply to an independent 110 / 120 volt outlet, using an extension cord if necessary. The "220-240 VOLTS" lamp will illuminate when you have the right outlet; if it doesn't illuminate, try a different outlet. 220 / 240 volts is now available at the "220-240 VOLTS" outlet on the Quick 220 Power Supply. Plug in your 220 / 240 volt equipment and use it. Waht do you mean by "independent 110/120 volt outlets? Use heavy duty, 12-3 AWG extension cords (or heavier) with 3 prong plugs for equipment loads over 13 amperes. These are available at most hardware and home centers. How much power can I draw from this converter? This 220 Power Supply will furnish 15 amperes. If your equipment is rated in watts, 15 amperes at 230 volts is the same as 3450 watts. For the 15 ampere (3450 watt) systems, momentary loads of 75 amperes or 16,500 watts can be supported. Momentary loads are often encountered when starting motors or when powering up electronic equipment. One cannot draw more current (amperes) from the wall outlet than its circuit breaker or fuse rating. TURN OFF All other appliances, and electrical devices that are running on the same two circuits you are plugging into. This includes the current required by your 220/240 volt load plus any 110/120 volt item which may share the same circuit: lamps, stereos, hair dryers, etc. It may be necessary to disconnect the lamps, stereos, hair dryers, etc., if you trip a circuit breaker you will need to reset it and check to make sure all other items are off on that set of lines. 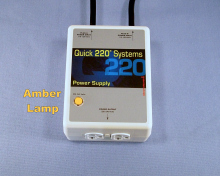 To protect people and equipment, the Quick 220 Power Supply's automatic safety interlock blocks all power to the 220/240 volt outlet until electrical connections are complete and correct. 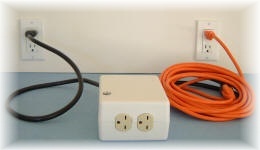 Should one of the cords become disconnected or loose power, all powered connections to the 220/240 volt outlet are immediately and simultaneously disconnected, including the exposed power cord. Internal test circuits are employed to assure wiring, polarity, and output voltage are correct. Safety circuits can be checked by listening to the Quick 220 Power Supply at the time it is connected to 110/120 volt power; it will click if safety circuits are operating. The Quick 220 power Supply conforms to the safety requirements of UL Standard 1012. It has been independently tested to this UL Standard by Intertek and has earned the right to bear the Intertek Listed Mark. Intertek is a Nationally Recognized Testing Laboratory (NRTL), recognized by the Occupational Safety and Health Administration (OSHA) for this testing. How does 3 phase power affect this system? Do I need to use 3 prong grounded wall outlets? Yes! The amber lamp on the front cover will light when connection is made to an outlet on an independent circuit. If the lamp doesn't light, try different outlets until it does. Technically, an independent circuit is one that is 180 degrees out of phase with the first. buildings have numerous outlets that meet these two requirements. mobile equipment you need for your business. your equipment or on the road with you as part of a mobile charging setup for your electric vehicle. power one of our Vapor Rino Steam Cleaning systems there are few things you should be aware of. extension cord is used it should also be 12-3 or heavier. turned off. You will need all the available power from both 15 amp, 115V outlets to run this machine. converter. This will avoid overheating. to see what your outlets are putting out. Anything over 115 Volts is great. tool and a must have. If mine ever does wear out, I will positively buy another one! It is worth every penny. made my life easier in this area. converter top rating. All the thumbs up and gold stars I can find, go to this great little device.